If you’re looking for an exhaust hood cleaning service in the Denver area, you’ve found the right place. ProCo Hood Cleaning proudly offers many services, but exhaust hood cleaning happens to be our specialty. Insurance companies and the board of health require that you have your exhaust hood cleaned regularly. As a general rule, every three months is a recommendation for a restaurant that uses a lot of grease. WHY CHOOSE PROCO HOOD CLEANING? When you’re working with ProCo, you will only be working with the most qualified, and the best hood cleaning experts in the Denver area. Our technicians spent many months to be trained and certified in professional exhaust hood cleaning. We will “outshine” competitors by far. We are passionate about helping commercial kitchens and restaurants stand out. Don’t get dinged on your upcoming inspection for the petty stuff. Call us and we will make sure your hood system is cleaned up to standard. During our service, we will also thoroughly inspect your kitchen exhaust hood system. We will check for any safety violations or potential problems. Our technicians will always keep you informed during our inspections. ProCo technicians know how to properly disassemble your kitchen hood system and clean all areas appropriately. By doing this, we can ensure that we aren’t missing anything. 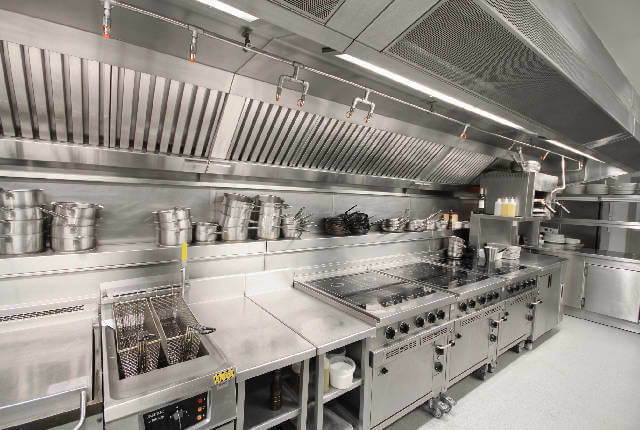 WHAT’S INCLUDED IN AN EXHAUST HOOD CLEANING? Great question. First of all, we want you to know that we will always discuss your needs with you before beginning any work. 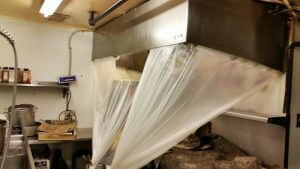 Most of the time, when we clean an exhaust hood system we will take it apart and inspect anything. When we clean it, we will ensure that it is cleaned to standard and up to code. We will always use appropriate tools to get the job done. When our exhaust hood cleaning technicians come to your kitchen, they will inspect the entire system. We will inform you of any risk factors, code violations, or potential future problems. We will detect fire hazards, corrosion, or hazardous odors. Then we will inform you on what we are about to do and what needs to be done to ensure that you can be knowledgeable about your kitchen. Then we will get to work. When we are cleaning your exhaust hood system, we will use safe, FDA-approved chemicals and the latest innovative technologies. We will determine whether to use steam cleaning, pressure cleaning, or another cleaning technology. We will take apart your hood system so that we can clean it accordingly. Then we will put it back together appropriately. When we are finished cleaning your hood system, it will sparkle like new. 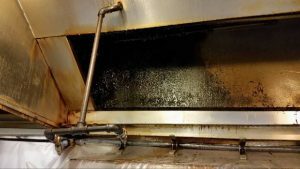 WHY IS IT SO IMPORTANT TO HAVE AN EXHAUST HOOD CLEANING DONE? Grease is dangerous stuff, man. The majority of restaurant fires are the result of a grease build-up in the hood system. That’s why many insurance companies require that you have it cleaned and maintained regularly. And a grease fire is a difficult fire to deal with. We would say that a grease fire spreads like wild fire, but it’s probably worse. It spreads like…grease fire. A grease fire happens when grease and smoke make contact, and the grease is hot enough to ignite. Once it ignites, it spreads quickly. Grease becomes liquid, which splashes, which is essentially several balls of fire splashing everywhere. 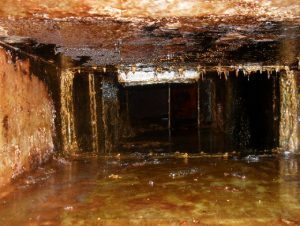 In fact, if you ever talk to a fire fighter who has dealt with a grease fire, he might tell you that it was particularly complicated for this reason. You cannot put a grease fire out easily with water because grease is liquid. Water is also liquid and by adding it to the grease, it will only make the grease splash and spread. Special solutions must be used to put out a grease fire. Let’s put it this way, a grease fire is not a predicament you want to get yourself into. A grease fire is the greatest risk you take when you let your exhaust hood cleaning go for too long. Get on top of it. Call us today so we can inspect and clean your commercial kitchen exhaust system.